Crunchy, nutty and delectable almonds are a treasure trove of essential nutrients. For most people, it is a common desi practice to start off day with a handful of soaked almonds. They are also a good source of minerals such as magnesium, zinc, calcium and potassium. Apart from this, they are also known to boost heart health, digestion, brain power and so much more. Almonds are used extensively to flavour our most decadent desserts but you can also include them in your weight loss-friendly smoothies, shakes or cereals to take the flavour a notch up. 1. Boosts brain power: Almonds are a potent source of vitamin E. The antioxidant is very effective in supporting brain and also keeps your skin supple. Almonds are also replete with riboflavin and L-carnitine; these nutrients are linked to decrease occurrence of Alzheimer’s disease and boost brain activity and cognition. 2. Sleep Inducing Properties: Struggling to catch some sound sleep? Try snacking on almonds. Almonds come loaded with tryptophan, a hormone that has a soothing effect on brain. They are also enriched with magnesium, which helps keep your heart rhythm steady. 3. Aids Weight Loss: Almonds are a good source of plant-based protein. Protein helps keep you satiated. It also helps regulate hunger hormone ghrelin and keeps a check on cravings. Almonds are a good source of dietary fibres too, which help facilitate digestion. A healthy digestion is key to weight loss. The monounsaturated fats present in almonds are also helpful in keeping you full for a longer spell, which further prevents overeating. 4. Support Heart Health: Rich in omega-3 fatty acids and vitamin E, almonds when eaten in moderate quantity, are helpful in keeping the heart healthy. Almonds are also effective in reducing LDL (bad cholesterol) due to cholesterol-reducing fatty acids; such as oleic and palmitoleic acids. 5. Diabetes Management: Almonds are a good source of fibre, which enables slow release of sugar in the bloodstream. They also have very low glycaemic index or GI. Glycaemic index is a relative ranking of carbohydrate in foods depending on how they affect blood glucose levels. Foods with low GI index take time to get digested and metabolise, which enables gradual release of sugars. Experts say it is better to have almonds raw and soaked. The peel tends to contain tannins, which may come in the way of nutrient absorption in the body. 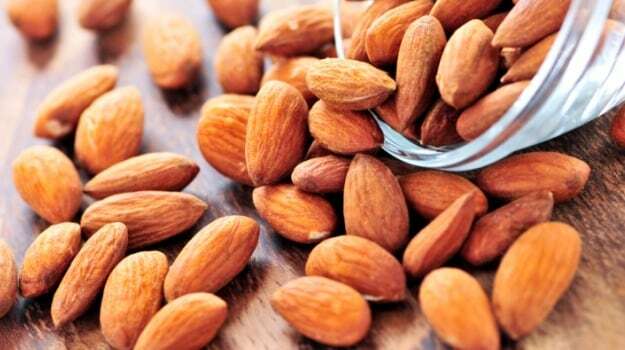 Soaking almonds also releases the enzyme lipase, which facilitates digestion of fats. Tagged 5, Almond, Almonds, Benefits:, Eat, From, Health, Heart, Improved, Loss, More, Reasons, To, Weight?